On Creatubbles, you can share anything as long as it is your original creation and does not contain personal information. Please find below the file formats that are supported on Creatubbles. From a computer web browser, you may also share creation using the URL. Please find below video about how to upload a creation using the URL. Below is the list of platforms from which you can use the URL to share on Creatubbles. 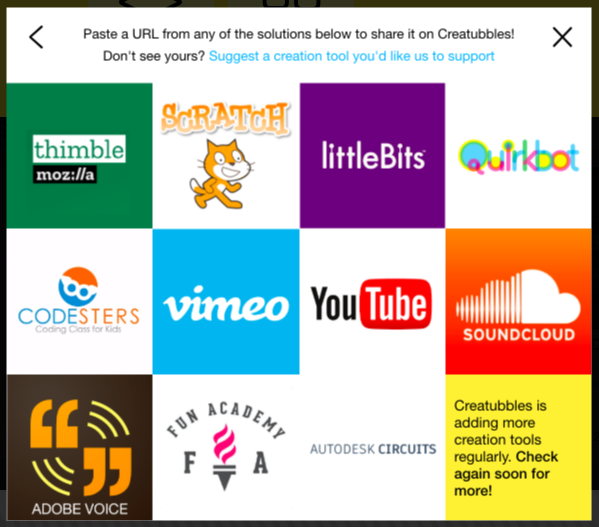 Please note that creations need to be "public" on all of these platforms in order to share on Creatubbles. If you have any questions or request of platforms to be added, please contact us at support@creatubbles.com.